Hey y'all! I hope your week is off to a great start! So far, so good here. I made it the YMCA yesterday for boot camp but I didn't have my Fit Bit. Last week, my oldest daughter broke my band (it was already coming apart) so I haven't worn it since Thursday. I have been way less motivated without it because I feel like my steps aren't counting, lol. It's so silly but true. I have to have motivation and that's exactly why I always take group exercise classes. I won't push myself alone. 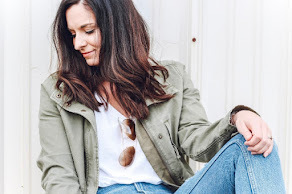 Today, I'm styling this comfortable spring look featuring pretty jewels from my friend Lauren Ingold, a Stella & Dot stylist. Stella Dot jewels are not only gorgeous but such high quality for amazing prices. Gold statement earrings and a gold cuff are the perfect accessories to take a casual look up a notch. A cuff is my favorite type of bracelet to wear, especially during warm weather. 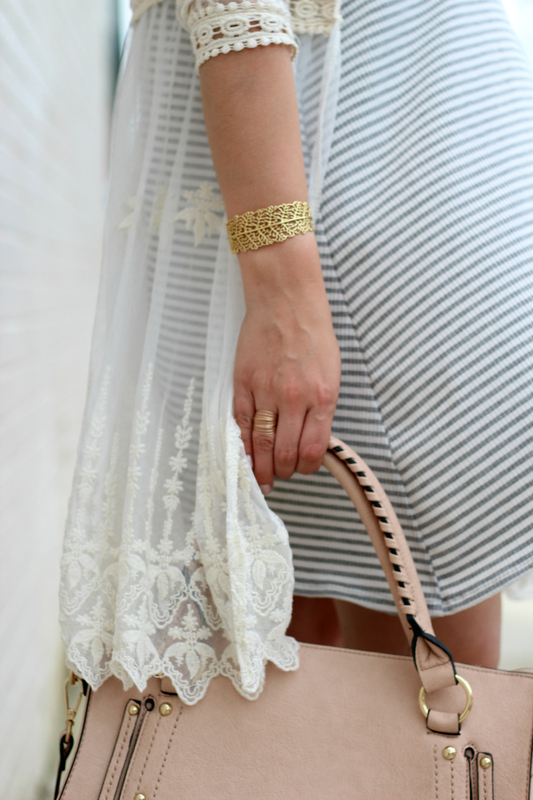 I styled my Stella & Dot jewels with a striped swing dress, lace cardigan, flatform espadrilles, and a blush bag. 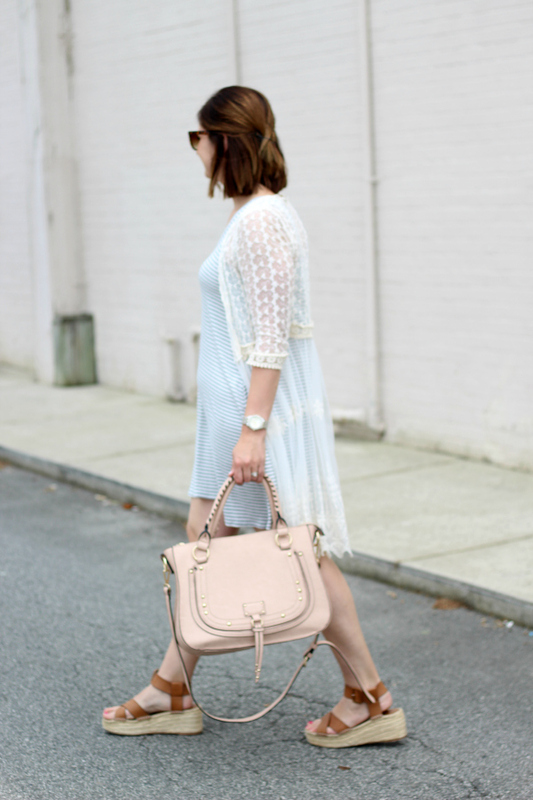 I am loving this soft color palette for spring like I mentioned last week, a swing dress with a cardigan is my favorite look for this season! I hope you all have a wonderful day! Thanks for visiting! I love your jewelry and this outfit so much! It is so cute! Love the outfit! It's so perfect for spring! So cute! I can't wait to wear outfits like these when it actually stops being cold over here in Londond! Ha! You look so cute!!! Saw the cuff on your Instagram and loved it! The earrings are gorge too! I love Stella & Dot! Such cute items! 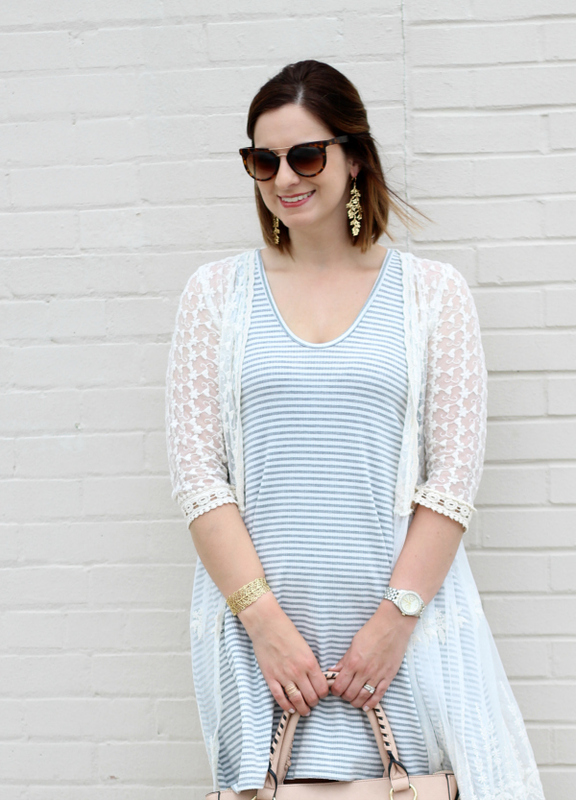 Cute striped dress!! That cuff bracelet is so delicate and elegant. Love it.